Even before his time as an REI manager, David Spaulding’s passion has been biking, and his enthusiasm for it is contagious. 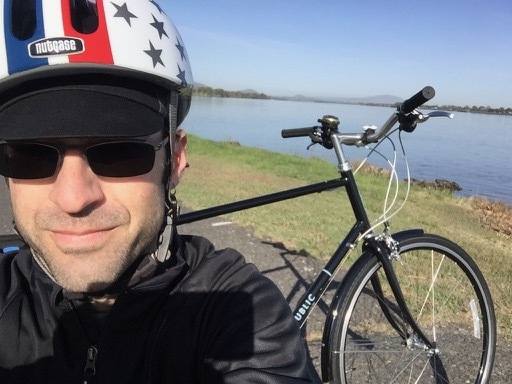 Since his move to Washington state, David has long desired to share this enthusiasm with the Tri-Cities community along the mighty Columbia River, connected by 23+ miles of rivershore trail - Kennewick, Pasco and Richland. Several years ago, he purchased a fleet of commuter bikes and opened the area’s first rental shop. David hoped to energize the locals and area visitors by capitalizing on the beauty of the river, the availability of scenic trails, and by offering a family-friendly alternative to running or walking. The following year, David realized his dream of opening the full service Liberation Bike Shop in historic downtown Kennewick. A popular sales and repair shop, Liberation embodied David’s vision in its name, as David hoped to enticed store visitors to find new freedom on the seat of a bicycle. Still, there was something missing... and a year later, David opened up the area’s first community bike shop. Wheelhouse Community Bike Shop is a nonprofit community cooperative offering rentals and sales, classes, community programs, youth programs, bike recycling, volunteer events, and advocates for the growing Tri-Cities bicycling community. Wheelhouse is also a full- service shop, offering tune-ups, customized bike and seat-fitting services, and regional biking information. After all those years, David decided he could also build on his vision by opening his own Trips for Kids chapter and on Sunday, March 17, 2019, Trips for Kids Mid-Columbia held it's inaugural ride. The Mid-Columbia chapter works with youth ages 10-17, serving local elementary and middle schools with many of their kids coming from lower or middle-income families, along with some who are at risk and children of immigrant families from Africa and other countries. Trips for Kids mid-Columbia offers Discovery Trails as part of their Mobile Bike Clinics. The first ride was such as success that they already have their second ride scheduled for Sunday, April 14! Please join us in welcoming David and his team into our family and wish him luck on their first rides of the season.